Maybe this time, they won't miss the bottom!! Bottle service for Nouriel Roubini!!! Maybe the shorts should realize, that this market takes no prisoners. Heck, even bull dung can be used to make newspaper!! While Jesus may have turned water into wine, Mr Reilly has gone for a more practical transformation – he's figured out a way to turn bull dung into paper. 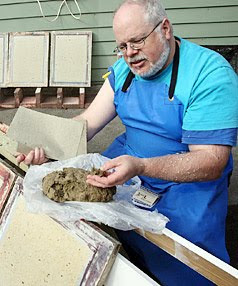 During studies towards his Bachelor of Fine Arts at Whanganui UCOL, Mr Reilly discovered an affinity for paper-making. In his research, he found different cultures were making paper from many fibrous materials – including kangaroo poo, wombat faeces and elephant manure. Back in his hometown of Bulls, there was one logical step. A couple of bull farmers were more than happy for Mr Reilly to clear their paddocks, and he went to work with the pooper scooper. Figuring out how to turn raw poo into paper took a bit longer – 15 months in fact, for the smooth transformation to be honed. First Mr Reilly has to rehydrate the bull patties, covering them with litres of water in plastic buckets and leaving them to soak. "There's fibre from grass in there, the bull doesn't actually process the fibre," Mr Reilly explained. "It needs a good couple of weeks to soften up the fibre and start breaking down." After a fortnight – during which the mixture is stirred occasionally – he sieves the waste from the fibre. I guess that 's what's wrong with the bears. They don't read newspapers, and they only can spot a nice bottom on the Internet. Because they obviously can't spot one on Wall Street! Even when its "harrowing!!!!" Oh I forgot!!! They're just following their own script. They pay for their bottoms!! So let's toast the bears! Dude I spat out my sandwich from that first picture!